Welcome to Marvel Strike Force Heroes page. This is the full description of MSF Iron Fist stats, skills and abilities. Iron Fist is a Mystic Brawler who heal himself and delivers deadly blows. His first skill inflicts medium damage but it can chain to 3 additional targets. Inner Peace is his second skill and it heals him for a moderate amount and clears negative effects. Iron Fist ultimate delivers massive damage to the target but also applies Offense Down on Iron Fist. Passive ability grants him a 10% chance for healing at the start of each turn. Iron Fist is an underestimated hero who can sometimes be useful in some segments of Marvel Strike Force. After the Defenders Update, Iron Fist can heal other Defender Heroes and his damage is increased. His price is 45 shards which can be obtained through Mega Orbs, Premium Orbs and 1-9 Nexus Campaign mission. Iron Fist is a versatile martial artist with healing abilities and a powerful single target attack. Attack the primary target for 300% damage. Gain Offense Down. Cannot be Blocked. On Spawn, heal self and DEFENDER allies. On the turn, 20% chance to heal self. Gain + 5% damage for each DEFENDER ally. What are Iron Fist's Stats? 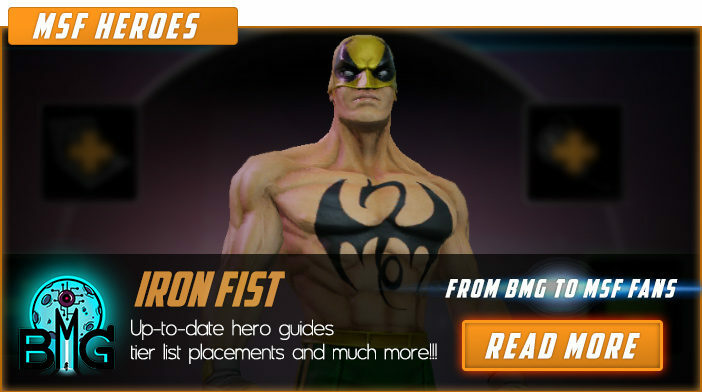 We hope that you enjoyed the description of MSF Hero Iron Fist. For detailed information about other MSF Characters check our MSF Heroes page.